After two months of "false alarms" and one missed trapping attempt, on 5 December 2003 we finally were able to capture and band a hatch-year female Rufous Hummingbird at the home of Lenore Berry in Rock Hill SC (York County)--about 15 miles from Hilton Pond Center. This bird apparently had been making sporadic appearances at the Berry feeder since early October 2003. After banding, the hummer spent the winter and even got featured on our Web report for the York/Rock Hill 2004 Christmas Bird Count. We arrived in Rock Hill at about 7 a.m.--shortly after sunrise and somewhat later than we usually start. We had asked Lenore to bring in her two hummingbird feeders the night before so her hummer wouldn't make a post-dawn feeding before we arrived. 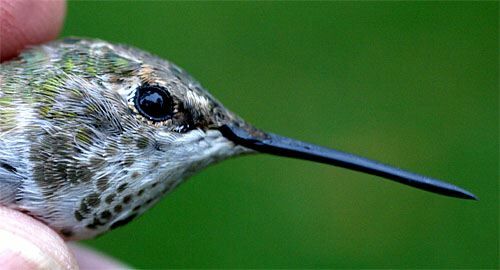 That may have been an unnecessary precaution, however, because after we hung our portable hummingbird trap out the window at 7:10 a.m., we never saw the bird until an hour later when it took a split-second look at the apparatus and departed. (In the meantime, we had eaten two pieces of raisin nut bread.) A few minutes later the hummer returned and entered the trap to feed, so we hit the button on our remote release and watched as the sliding door on the trap closed behind the bird. As the bird hovered in the trap, it only took us a second to see it was banded on its right leg--a likely indicator it was indeed the bird we banded the preceding year. And, when we had the bird in hand, we read the number--Y14855--to determine that it truly WAS Lenore's long-lost buddy from last winter. One look at the bird's plumage told us it was healthy and had matured nicely; the hummer's feathers were much sleeker and colorful than when the she was a juvenile, and her throat now bore nine red-orange metallic feathers (above left) where last year there had been only three (above right). Although this bird had replaced all of its feathers since last winter, there was no sign of current molt. Interestingly, last year her wing chord--the distance from the bend of the bird's wing to the tip of its longest primary feather--came in at 46.1mm, while this year it was 44.4mm (see table above). We see this phenomenon in Ruby-throated hummingbirds, with juvenile wing feathers being 2-5% longer than those in the same bird when it becomes an adult. One speculation is that young birds need that little bit of extra wing to help them make it through their first long migration; after they're adults and become better flyers, it might be more efficient to have slightly smaller wings. We noted that the tail was also slightly shorter this year, but the 0.5mm difference in bill length may have been a measurement error; the bird's bill likely full-grown at the time it fledged or soon after in the summer of 2003. Few winter vagrant hummingbirds captured in the eastern U.S. have showed up away from their original banding sites. 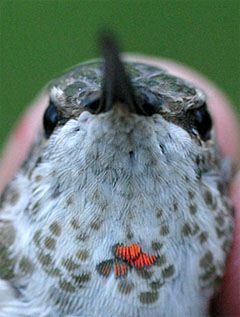 We were fortunate to band a male Rufous Hummingbird in November 2001 and have it recaptured in Columbus, Ohio, in November 2002. This bird may tell us a tiny bit about dispersal and migration, but we need a lot more foreign encounters of banded winter hummingbirds before we can begin to draw conclusions about why they aren't in Mexico or Central America with their conspecifics. Foreign encounters are also necessary if we are to know where these winter vagrants actually breed. Returns such as the one from Lenore Berry's house are nonetheless valuable because they do allow us to learn about molt patterns, site fidelity, and longevity. Lenore's second-year female has a ways to go before tying the Rufous Hummingbird age record of eight years, but it could happen. And nothing would delight us more than going back to Lenore Berry's home every winter for the next six years to capture #Y14855 AND have still more helpings of that fabulous raisin nut bread. We can hardly wait to see if her bird comes back in 2005. NOTE: This bird was retrapped yet again in the winter of 2005. 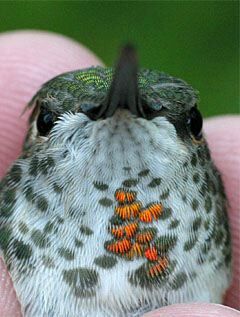 See Perdita: The "Lost" Rufous Hummingbird. Hilton Pond Center for Piedmont Natural History is a non-profit research & education organization in York, South Carolina USA; phone (803) 684-5852. Directed by Bill Hilton Jr., aka "The Piedmont Naturalist," it is the parent organization for Operation RubyThroat. Contents of this website--including articles and photos--may NOT be duplicated, modified, or used in any way except with the express written permission of Hilton Pond Center. All rights reserved worldwide. To obtain permission for use or for further assistance on accessing this Web site, contact: Webmaster.